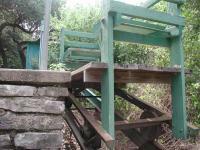 The area surrounding Laguna Gloria is now a respected community of well kept homes. But 100 years ago this area might have been Austin's first industrial park. Evidence of this activity can still be seen here and there. The most visible sign resides in Reed Park. Here one can find a huge rock and mortar structure that resembles a chimney, which to an extent it was. 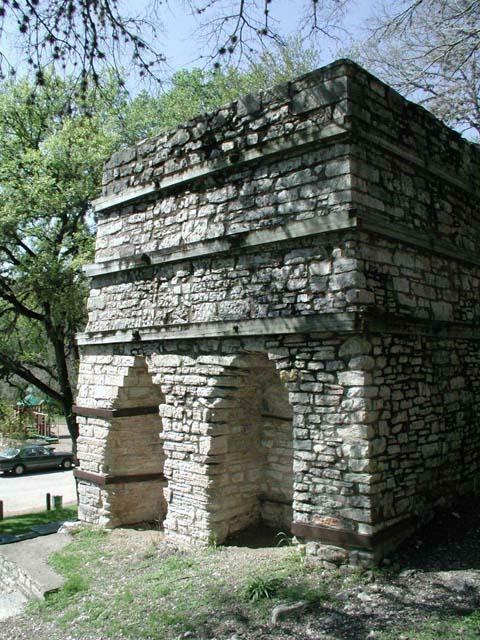 The large structure is called a Lime Kiln and Scottish immigrant Peter C. Taylor built this one in 1871 to provide lime, which is used for various purposes including the manufacture of mortar to hold bricks or stone together. 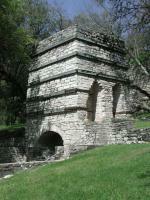 Lime kilns are simple devices that take limestone and output lime. The operation of the kiln is surprisingly simple. 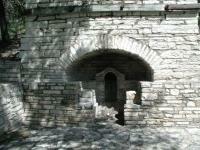 The kiln is hollow in the middle and a combination of limestone and fuel (often coal or wood) is dumped into it. When ignited the fire and heat burn off carbon from the limestone (a relatively soft rock) and a quick lime powder is the end result. 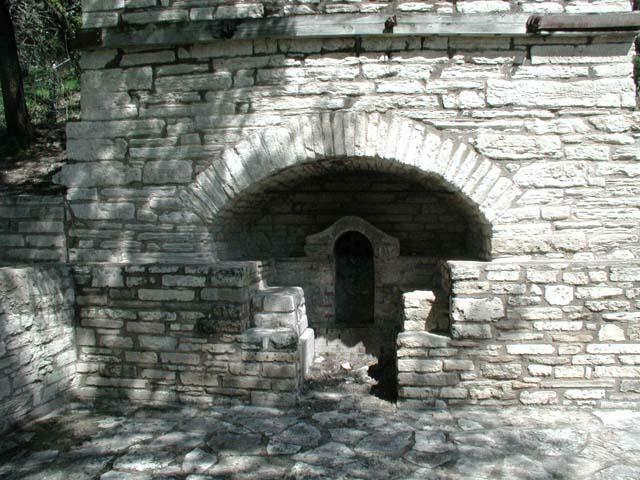 The kiln typically had 3-4 openings. The first we already mentioned at the top where the limestone and fuel was dumped. About halfway down the kiln one or more stoking holes allowed the fire to be managed, much like stoking a fireplace fire to burn all of the wood. The final hole resided at the bottom of the kiln, from which the resulting lime was extracted. You can read more about how a slightly more modern kiln works here. 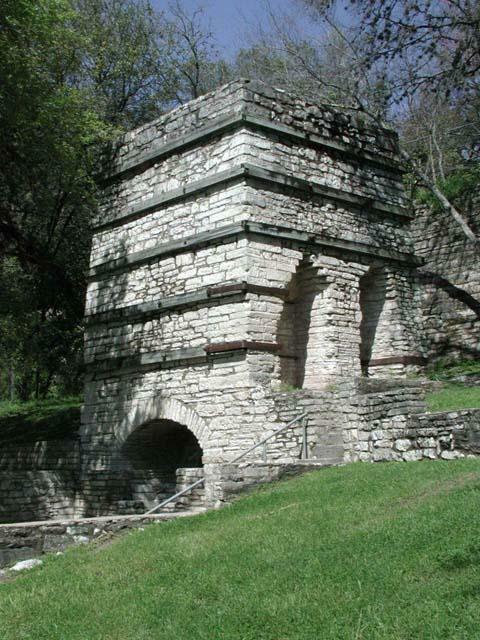 Taylor didn't just build a lime kiln, he also innovated. He was issued a patent for the triangle brace improvement to the kiln. 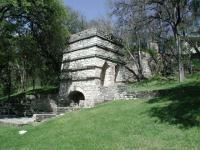 Stone kilns are massive in part because they need to withstand a lot of heat. But they still needed ample cool down periods to prevent them from being damaged. Taylor's triangle brace help support the kiln walls in such a way that allowed them to be operated on a much more aggressive schedule. With less downtime the kiln could produce more lime, and thus more profits. The wooden beams that surround the kiln may be part of Taylor's braces, but we're unsure. We have seen pictures of other kilns that contain similar beams, so it's less likely that they were placed there later to support the structure to keep it from deteriorating. The remains of the rail system along Scenic Drive. 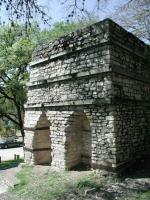 With Taylor's braces the kiln could operate in continuous mode, as lime was removed from the bottom of the kiln it freed up space above, which was quickly filled with more limestone and fuel. 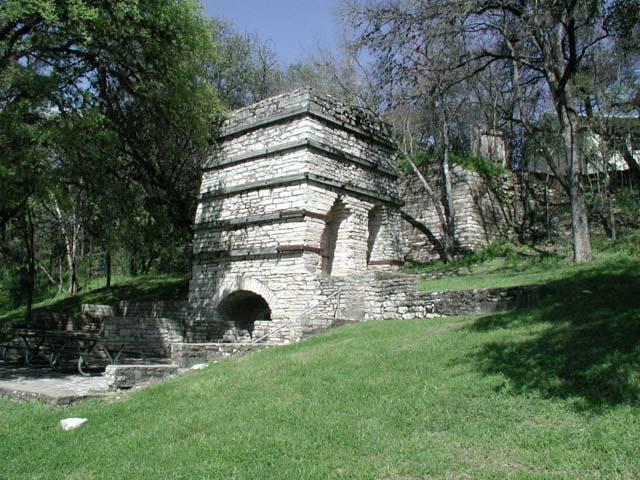 Many of the old houses in Austin were constructed with mortar made from this very kiln. If you look closely at the pictures you'll notice that there appears to be a stone wall behind the kiln. Most likely this supported the "bridge" that was used to haul limestone and fuel to the top of the kiln to be loaded. 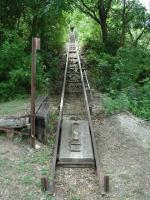 A closeup of the rail cart at the top of the hill. Not far from the lime kiln, on Scenic Drive, sits the remains of the rail car that was used to transport materials to the kilns. 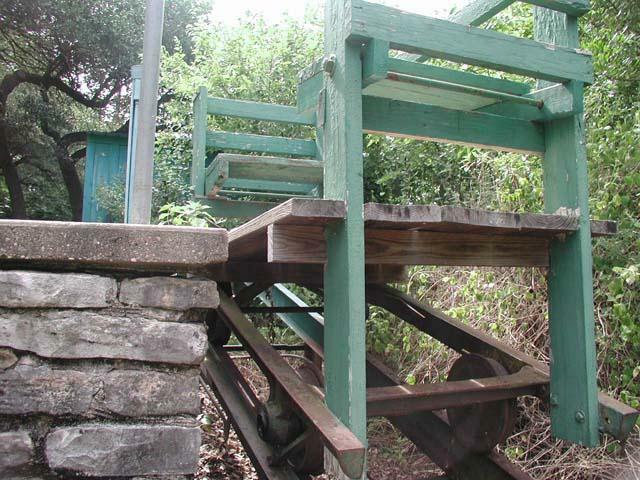 The rail runs uphill and at the cart that traveled up and down the rail sits idle. The entire system actually looks to be in very decent shape and almost certainly does not date to the start of the lime kiln's operation in the 1870's. The top of the hill is someone's backyard, so if you venture up the hill to take a look at the cart please be considerate. Stay off of the top of the hill and don't loiter around. Apparently yet another sign of the kiln operation exists in the area. A second kiln is said to reside in a spot one mile south of this location. We'll report on these remains when we can locate them. Stopped by on the way home from work. It's still an impressive sight. I'm sure the area was a bit less pleasant when this was spewing smoke into the air! Photos are from an earlier visit. Kind of interesting to see.